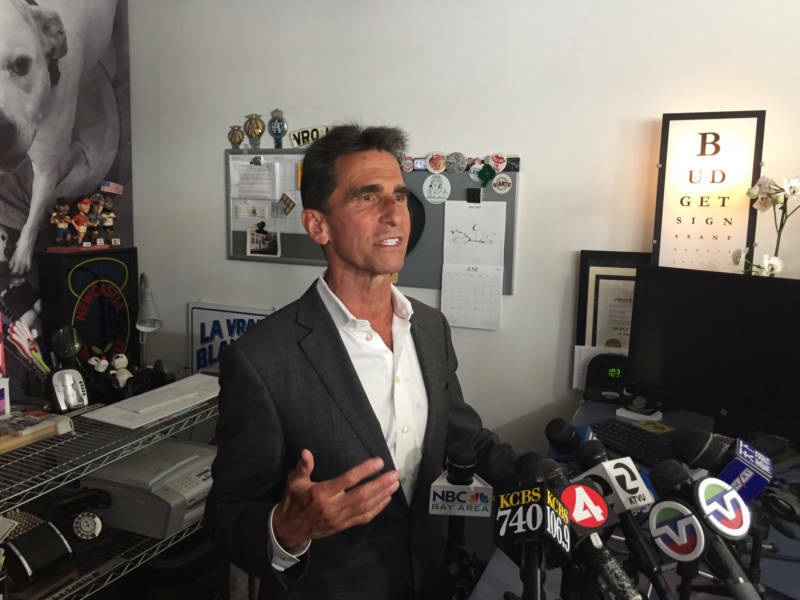 Updated June 14, 10:50 a.m.
Former state Sen. Mark Leno conceded the extremely close San Francisco mayoral election at a press conference Wednesday afternoon. "I called Supervisor London Breed this morning to congratulate her on her victory and to wish her every success, both personally and professionally, on her new job," Leno said. Breed held her own press conference a few hours later on the steps of City Hall, where she thanked all candidates for mayor and the voters. "Whether you voted for me or not, as mayor, I will be your mayor, too," she said. As of the last vote update on Wednesday afternoon, Leno trailed Breed by 2,177 votes under the city's ranked-choice voting system, with a few thousand ballots still left to count. At this point, it would take a vote-counting miracle for Leno to overcome Breed's growing lead. At the end of counting on election night, Breed held a nearly 10 percentage point advantage over Leno in first-place votes. But under the ranked-choice system — which reallocates second- and third-place votes from other candidates to the top two finishers — Leno actually finished the night up by just over 1,000 votes. It would prove to be the high-water mark for Leno, who saw his lead shrink day by day as tens of thousands of additional ballots were counted. On Saturday, Breed regained the lead. She continued to grow that margin to 1,861 votes as of Tuesday afternoon, leading to Leno's concession on Wednesday. Leno pointed to Breed's consistent gains and growing lead when asked why he decided to concede before he was mathematically eliminated from winning. "We haven't seen a day where it hasn't gone in her direction," he said. "Just doing the math, we do not see that it is likely to change." During his press conference, he also said he wished Breed all the best when speaking to her, particularly given a number of complex issues facing the city. "Her success is San Francisco's success," he said. "She's going to need all the help she can get." Even with Leno's concession, the San Francisco Department of Elections will still need to finish counting the thousands of outstanding ballots and certify the final results by July 5. The Board of Supervisors would then likely declare Breed the mayor at their July 10 meeting, setting up a July 11 start date for Breed's term as mayor. 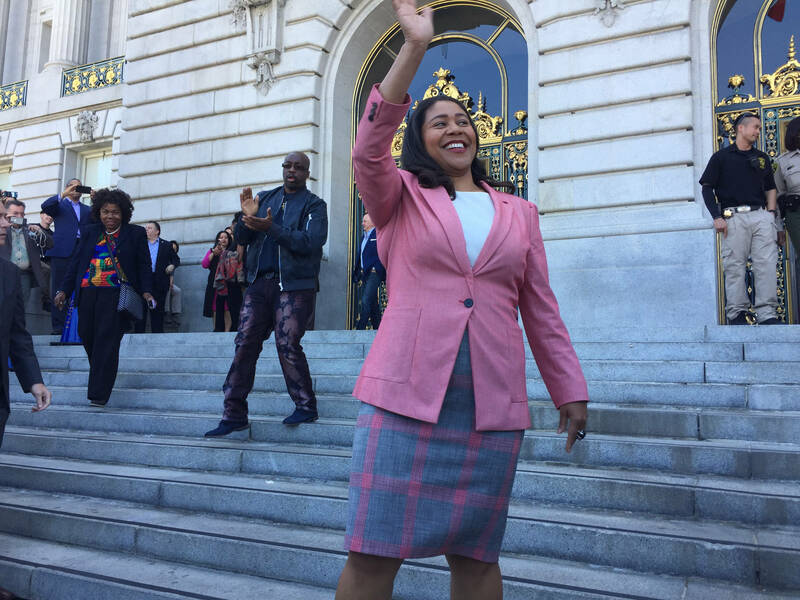 At the start of her press conference on Wednesday, however, Breed introduced herself as the "soon-to-be mayor of the city and county of San Francisco." Leno's concession ends what has been a wild and competitive six-month race for the city's top job, which was necessitated by Mayor Ed Lee's unexpected death in December 2017. He was a "true public servant," Breed said. Upon Lee's death, Breed — as president of the Board of Supervisors — became acting mayor. This raised her profile across the city and perhaps cemented her decision to run for the office in the June election. Seven other candidates jumped into the race, with Breed, Leno — who was already planning to run to replace Lee in 2019 — and Supervisor Jane Kim emerging as the front-runners. Breed was endorsed by the city's political establishment, including former Mayor Willie Brown and many tech executives, including investor Ron Conway, whose left-leaning critics see him as emblematic of a changing, gentrifying San Francisco. "It was the support she was getting from trusted leaders in the city across the spectrum of race, ethnicity and ideology that ended up making her pretty popular as a mayoral candidate," said Jason McDaniel, associate professor of political science at San Francisco State University. Seeing Breed as a more moderate candidate and not wanting her to have an incumbent's advantage in the election, progressive supervisors banded together to replace Breed as acting mayor and appoint Supervisor Mark Farrell to serve as mayor until the June election. This electrified Breed's base, and the election became a classic San Francisco moderate-vs.-progressive battle between Breed on one side and Leno and Kim on the other, running to Breed's left. This was especially true on housing, where Breed is seen as more business-friendly and likely to side with developers, while Kim and Leno cast themselves as more likely to extract concessions from builders around affordable housing. However, at his concession press conference, Leno rejected that characterization. "It does an injustice to the nuances and complexities of the debate we've just been through," he said. He pointed to other local results from the election as progressive victories. He also thanked San Francisco voters for coming out in high numbers, and urged them to stay engaged during what may "be remembered as a very challenging time for us," he said. In the end, the plot by progressives to remove Breed as acting mayor may have helped her more than Leno and Kim, according to McDaniel. "It galvanized her core supporters," McDaniel said. "It also took away any ability for Leno or Kim to blame London Breed for some of the things happening in the city now, like homelessness. It may have taken away a strategic avenue of attack that Leno and Kim could have used if Breed had been the interim mayor." Breed also talked Wednesday about the issues facing the city, such as homelessness and high housing costs, and called on people to work together now that the campaign is over. "We know that there is so much work to do," she said. "I am so hopeful about the future of our city," she said. "I am prepared to make sure I do everything I can to work together, to bring the Board of Supervisors together, to bring everyone together. "What's important is we focus on the work," she repeated. "It is time for us to forget about the drama in the world of politics during the campaign and focus on making our city better for all San Franciscans." Toward the end of the campaign, Leno and Kim threw in their lots together, asking voters to rank them one and two on their ballots, in hopes of using the city's ranked-choice system to compensate for Breed's expected strength in first-place votes. That strategy is likely what kept Leno in the race so long. As of the latest count released on Wednesday afternoon, Breed led Leno by nearly 30,000 votes and 12 percentage points in first-place votes. But Leno received more than 40,000 of Kim's second-place votes, which was more than three times as many as Breed received. In his concession speech, Leno called Kim a "great partner and fierce ally." In taking office, Breed would become the first African-American woman to serve as San Francisco's mayor. 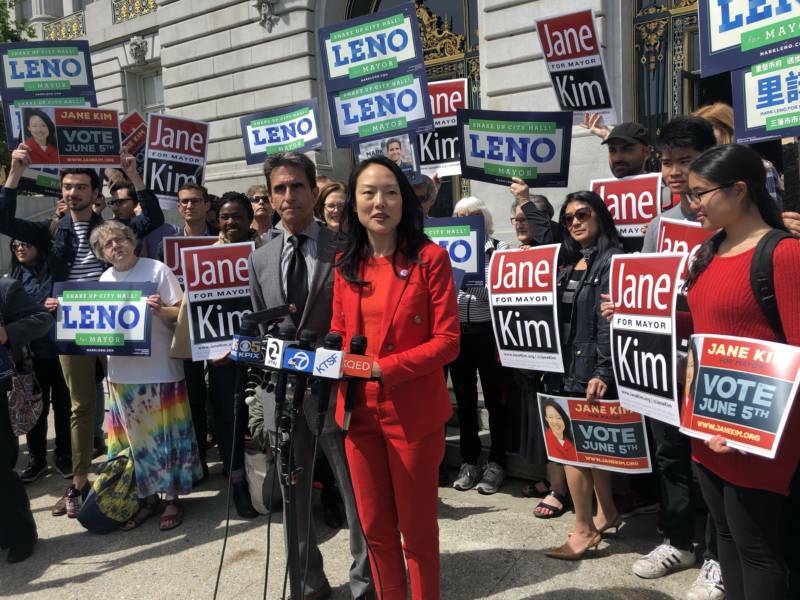 All three of the top candidates would have been a first for the city: Leno would have been the city's first openly gay mayor and Kim would have been the first Asian-American woman to lead the city. Leno declined to say whether he would run again for another office and what his plans are from here. "My life has been all about community and then public service, and I don't think that's going to change anytime soon."